This notebook case features a stylish design and a variety of convenient features to satisfy both students and executives alike. Tripp Lite’s NB1001BK notebook briefcase is a practical solution for executives, commuters and students. In classic colors of black and charcoal gray, this briefcase features a variety of pockets and compartments to hold everything you need for your day at work, on the road or at school. The overall size of this bag is 13.5H x 20W x 4”D, so it will accommodate most notebook computers and tablets. The NB1001BK is made from lightweight 600 denier nylon. The bag itself weighs only 3 lb., so you can load it up without being weighed down. A sturdy padded handle ensures this bag is comfortable to carry. Metal fasteners attach the removable, adjustable shoulder strap, while sturdy plastic side-release buckles keep the front flap securely in place, protecting your belongings inside. The zippers are self-repairing, adding to the durable qualities of this bag. 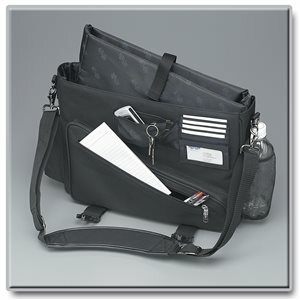 This bag’s main compartment includes a padded notebook sleeve that protects your computer or tablet. The sleeve has a security strap so your device doesn’t slide out when you remove the sleeve from the bag. Under the front flap of the NB1001BK, there is a small zippered pocket for holding keys, loose change and other small items. Five low-profile pockets hold business cards or ID cards. An angled, zippered pocket lets you stow your pens, pencils and other accessories. The outside of the NB1001BK sports a side accessory pocket, perfect for a smartphone and charger, plus a mesh pocket holds a water bottle, keeping moisture away from your other items. For peace of mind, the NB1001BK comes with a lifetime warranty. It’s manufactured in compliance with strict RoHS specifications, reflecting Tripp Lite’s commitment to environmental responsibility.